Preface (N.G. Adams, L.M. Babcock). Ion-molecule chemistry in interstellar clouds: successes and problems (E. Herbst). Complex formation in electron-ion recombination of molecular ions (R. Johnsen, J.B.A. Mitchell). Reactive probing of the potential energy surfaces of isomeric ions (N.G. Adams, N.D. Fisher). Dynamics of gas-phase SN2 nucleophilic substitutional reactions (W.L. Hase et al.). Barriers to internal rotation in substituted toluenes and their cations: effects of electronic excitation and ionization (E.C. Richard et al.). The influence of solvation on ion-molecule reactions (A.W. Castleman Jr). Thermochemistry of singly and multiply charged ions produced by electrospray (J.S. Klassen et al.). Positive ion-electron impact ionization cross sections: theory and experiment (P.W. Harland, C. Vallance). Index. Gas-phase ion chemistry is a broad field which has many applications and which encompasses various branches of chemistry and physics. An application that draws together many of these branches is the synthesis of molecules in interstellar clouds. This was part of the motivation for studies on the neutralization of ions by electrons and on isomerization in ion-neutral associations. 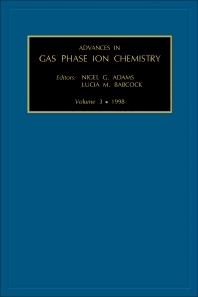 The results of investigations of particular aspects of ion dynamics are presented in this volume. Solvation in ion-molecule reactions is discussed and extended to include multiply charged ions by the application of electrospray techniques. This volume also provides a wealth of information on reaction thermodynamics which is critical in determining reaction spontaneity and availability of reaction channels. More focused studies are also presented towards the end of this volume, relating to the ionization process and its nature. For scientists and researchers in the field of gas phase ion chemistry.